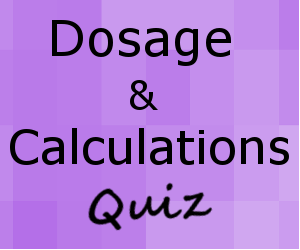 This quiz on weight-based dosage and calculations will test your ability to solve dosage and calculation problems of drugs that are based on a patient’s weight. These weight-based calculation problems were designed to help you better understand how to apply basic conversions to advanced drug problems. In nursing school, you will be required to learn how to solve these types of problems, along with other drug and dosage calculations. These dosage and calculation problems will test your ability on how to calculate weight-based drugs. 1. Doctor orders Dobutamine 4 mcg/kg/min IV infusion. The patient weighs 198 lb. You are supplied with a bag of Dobutamine that reads 250mg/250 ml. How many mL/hr will you administer? 2. Doctor orders Heparin 50 units/kg/dose subcutaneous daily. The patient weighs 93 kg. Heparin is supplied in a vial that reads 5,000 units/ml. How many mL/dose will you administer? 3. Doctor orders a Lidocaine infusion to be started at 30 mcg/kg/min. The patient weighs 298 lbs. You are supplied with a bag of Lidocaine that reads 4 mg/mL. How many mL/hr will you administer? 4. Doctor orders 20 units/kg/hr Heparin infusion to be started. The patient weighs 87 kg. You are supplied with a bag of Heparin that reads 100 units/mL. How many mL/hr will you administer? 5. Doctor orders Vancomycin 500 mg to infuse at 5 mg/kg/hr. The patient weighs 98 lbs. You are supplied with 500mg/100mL bag. How many mL/hr will you administer? 6. Doctor orders 9 units/kg/hr Heparin infusion. The patient weighs 76 kg. You’re supplied with a Heparin bag that reads 50 units/mL. How many mL/hr will you administer? 7. Doctor orders 12 mg/kg of Acyclovir. The patient weighs 115 lbs. Acyclovir is supplied as 100 mg/2mL. How many mL will you administer per dose? 8. Doctor orders 12 units/kg/hr Heparin infusion. The patient weighs 200 lbs. You’re supplied with a 30,000 units/500mL bag. What is the mL/hour rate? 9. Doctor orders 10 mcg/kg/min of a Dopamine infusion. The patient weighs 170 lbs. Dopamine is supplied as 500 mg/500mL. How many mL/hr will you administer? 10. Doctor orders 2 mg/kg of Lovenox subcutaneous daily. Patient weighs 155 lbs. You are supplied with a Lovenox syringe that reads 40 mg/0.4 mL. How many mL/dose will you administer?